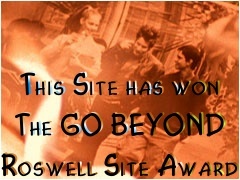 RoswellOracle.com is not an official Roswell site. This is a fan site for entertainment purposes only. No rights infringements intended. No profit is made from this site. Roswell, the characters, the story and the images, are owned by Melinda Metz, Jason Katims the WB, and Fox Studios. All original material, graphics, descriptions, reviews, layouts, theories, fanfiction, etc are property of RoswellOracle and RoswellOracle.com. These items were created by hours, days, weeks, months, years of my hard work. Please DO NOT use or repost any item without permission. That includes most of the artwork on the site that I either created or redrew from the designs on the show, including alien symbols, Crashdown Cafe logo and menu, UFO Center logo, WRHS logos, characters' clothing, alien items, maps, floorplans, etc. Make your own dang art instead of stealing mine. If you want to repost something from the site, just ask, and I will probably say yes. If anyone finds items they believe have been used without permission, please let me know. Unfortunately I wasn't as diligent in saving the sources of where I got things, and credits of who originally wrote, created, or posted the information and pics. Some things in this archive were originally written, created, and saved by others,and I'm not trying to take credit for any of that. I just wanted to share some of this great stuff. Corrections, additional credits, sources or other info are appreciated. Please email me at the address at the bottom of the page. Several of the sites where I obtained things are already gone, and I've made every effort to contact the owners to get permission, but in most cases I was unsuccessful. I will provide links back to the sites that are still active. I'll also give credit when I know who authored, created, saved or provided any items archived. Corrections are always appreciated. If you find broken links, have additional credits, sources or other info, please email me at the address at the bottom of the page. 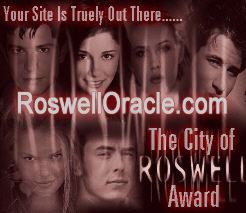 I am always looking for additional Roswell info, pics, videos, etc to put in the archive. If you have anything you are willing to share, please let me know and I will credit you for your submissions. Many caps used were obtained from several excellent caps sites. you can donate securly through PayPal and I'll list you as a contributor. This is AMAZING!!! Wow I am all gitty with excitment! Love that Roswell websights still live! No way Silver Hand Print be still my heart! Wow this is a blast from the past and an amazing way to honor such an amazing an powerful show that changed all of our lives and taught us the meaning that anything is possible. RoswellOracle congrats thats amazing news and from one Roswellian to another you make me so proud! 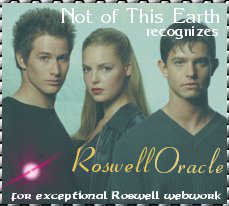 Thank you for that Labor of love Roswell Oracle the sight is gorgeous and a great resorce. I can't say thank you enough! You are so right about other Roswell sites concentrating on the actors and their careers. But the tv show Roswell and its story was so much more than that. The story line and how it would grab you into the lives of the characters was hypnotic to me. Oh, what a great show. Why didn't the Networks realise what a great story it was? Long live the love of Max & Liz! Hello fellow Roswellian! I just wanted to thank you for your very comprehensive site, which I have just found! 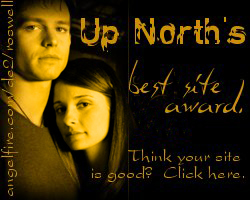 By far the best Roswell fan-site ever! I'm a huge Roswell fan and appreciate your work so much - I love that there is somewhere to go to just re-live the glory of Roswell. Thank you also for a beautiful and thorough website to archive and continue this world we've fallen for. Anyway, as a long time original Roswell fan, thanks again for being a major player in keeping Roswell alive after so long. I LOVE YOU FOR THIS!!!!!! I really like your website and its design, consistency as well as organization. Thank you very much for your time and effort and beautiful website. I've just come accross your site today, and I still can't believe how AMAZING and HUGE it is! You have done so many research, and collected so many things, it left me speechless. So for all your incredible work, I want to thank you! I've rarely seen such an amount of work in a fansite, and I am so glad you created an archive for "Roswell". The show deserves to be remembered, and what a great hommage you've created! I'm also really touched that you dedicated a few pages to other "Roswell" fansites and to what the fans have built together over the years. It's incredible to see the impact "Roswell" has had on so many fans, and it's nice to see you kind of paying tribute to the fans as well. RoswellOracle website rated by the members 9.9 out of 10. 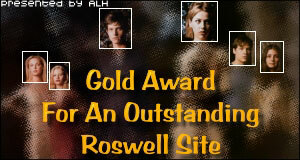 It used to be that pretty much every Roswell site issued awards to other Roswell sites. Some sites gave an award to anyone who had a site and asked for an award, other sites required a little more substance for an award. Most sites had varying degrees of awards for sites that were better than others, so for example a site might give awards for a good site, a very good site, and an awesome site. Some gave awards on amount of content or quality of content, artistic site layout, couple sites, fanfic sites, fanart sites, general Roswell sites, and all kinds of other things.